Bit Tooth Energy: Deepwater Oil Spill - is the well dead already? Deepwater Oil Spill - is the well dead already? Much of the focus of recent efforts at the Deepwater Horizon well site have been focussed on getting the relief well down to do a bottom kill of the well. However, in recent remarks the possibility has been raised that this may already have been done, and that the well is effectively dead already. In his press conference on Wednesday, Admiral Allen noted, relative to the understanding of the conditions at the bottom of the Deepwater Well, that there may have been some communication (in other words a passage) from inside the production casing, out to the annulus outside the casing. Following the cementing of the casing itself in the well last week and successful pressure test, we had discussion between the government science team and BP engineers, we believe there may be a chance that the cement that was forced down through the casing of the well entering the reservoir might have actually moved over and come back into the annulus which is the area outside the casing but inside the well bore. We want to understand the condition of the annulus before we actually drill into it so we are working with BP right now to establish procedures to do a pressure test that will tell us whether or not there’s free communication between the annulus and the reservoir itself or there’s cement that actually works its way over there from the static kill. Just to project out a little bit further for everybody’s information, once the well is killed it is no longer a threat of discharge at that point it will no longer be considered part of the response to the oil spill per say because there won’t be any source of the oil. In other words if the production casing passage is sealed, and the annulus is adequately sealed then the well is no longer a threat, and no longer part of the response activity. At that time the well moves into the jurisdiction of the Department of the Interior and their regulations, which have been discussed here earlier, of the steps needed to abandon the well. At the end of the drilling a plug of cement had been pushed down the production casing and out of the end so that it flowed back up the annulus several hundred feet. The well should have been plugged at the bottom. We now know that there was a failure at the bottom, since all the cement that was injected went down the production casing. This means that there had to be a passage between the well and the oil-bearing sandstone. I show this as green and it has eroded a path through the cement down to the bottom of the casing and then up the inside of it to the BOP and thence to the Gulf. 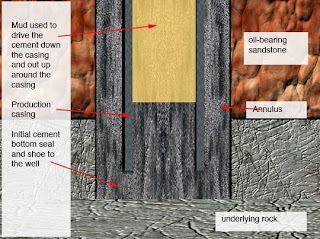 Note there has to be a passage through the annulus to the sandstone from the central section of the production casing for the oil and gas to flow. Now consider that in killing the well the cement was pumped down to the bottom of the casing and 200 barrels then went out into the annulus, and up into the oil-bearing sandstone. That may have been enough to totally seal the passages to the bottom of the casing but also any erosion that had taken place eating upwards along the outside of the casing through the annulus to the top of the cement. I wrote about that the other day, and as a reminder, this is what it may look like. Now the original assumption had been that the leak was up through the annulus of cement to the Gap that I show – but that turned out not to be the case. And remember that this is 800 ft above the shoe we were just talking about. 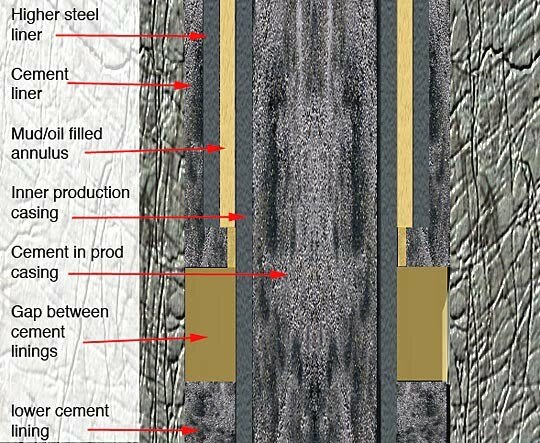 So if the relief well intersects here it has to drill a fair way down to check on conditions at the bottom of the well, if the cement lining at this point has integrity. 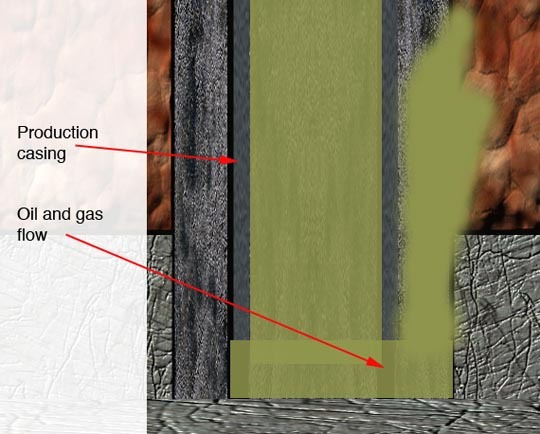 If there is no oil found here, which means there was no passage down to through the annulus (at this level, obviously there was at the bottom of the well) then as insurance they can inject cement back through the gap and annulus, but in reality the well is already dead. However if that is the case, and they want to fill the annulus here with cement, they have to be careful. For the outer annulus up at the BOP is protected by a seal. The Admiral described the problem and solution. The casing in which the drill bit and the well and the well pipe sits (hang) from the top of the well head. And then they kind of telescoped down to the smaller diameters. In that mechanism where they hang off the top of the well head, there was a seal and if enough pressure is applied from the annulus, this is outside the casing, on that seal it is meant to give way so it won’t cause damage to the well bore. 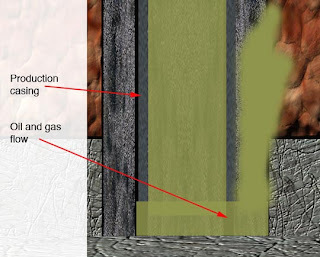 In other words it’s like a relief valve, and the seal which completely circles the casing at the top of the well if enough pressure is exerted will rise up and allow oil to flow. One of the theories was that somehow sometime during the explosion or what happened that that pipe was lifted up to allow that seal to be opened. It might have allowed oil to move up into the blow out preventer, it might have been the source of the hydrocarbons coming up other than the actual casing itself. We don’t think that’s the case right now we think it’s seated where it should be but what we wouldn’t want to have happen is to start pumping mud and cement into the annulus at the bottom is filled with cement and you have stagnate oil there. And we increase the pressure as we’re doing that so that stagnate oil is forced up and that forces that seal to rise up open itself and go into the blow out preventer. And as you know we restricted the pressure on the injectivity tests in the top kill to be less than 8,000 psi. 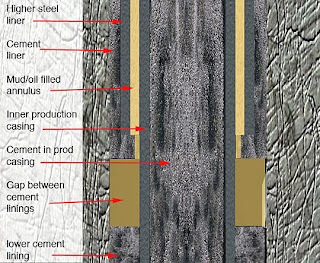 The cap itself is rated at 10,000 psi and what we want to understand is we go ahead with the mud and the cement for the bottom kill is there any chance at all that that would force stagnate oil up to the point where it would lift that up again, open those seals, push that up into the blow out preventer and the capping stack and at some point erode, approach pressures that might be a concern to us. We think it’s a very low probability outcome but the discussion of those seals and whether or not that pipe has ever been lifted is something that’s been discussed for some period of time. But we think we just need to rule it out before we go forward. By the Thursday press conference the storm had largely passed, the storm packer was being removed from the relief well, and a negative pressure test was being carried out at the top of the well, under the BOP, to ensure that the cement had no problems, and to see if with that lower pressure there was any flow out of the annulus. They are anticipating that once drilling restarts it will take 96 hours to intersect the annulus. I guess what I'm saying is if the cement is already there it would obviate the need to do the bottom kill because the cement from the top kill had worked its way into the annulus. That's what we're trying to find out. The way that they are doing this is to lower the pressure above the hanger that the production casing rides on, so that the seals to the annulus open. lowering the pressure in the stack enough where it would raise those seals on the hangar which would allow oil to flow up and if there was communication with the reservoir we would see an increase in pressure. That would tell us there is no cement in the annulus and we should proceed with the bottom kill. If for some reason the pressure stays level that would indicate that we have some kind of a static condition in the annulus and that would present the possibility that the cement had entered the annulus and we might either a full or a partial kill from the bottom accomplished with the static kill. . . . . . . .
What we hope we'll find out is there will be an immediate rise in pressure which will tell us there is hydrocarbons being pushed up from the reservoir and we should go ahead and proceed with the bottom kill. It will be more problematic and quizzical if there is no discernable change in the pressure readings. That would indicate that the oil is being held in place and its' static. That won't tell us how much cement and to what extent the communication between the reservoir and the annulus may have been filled with the static kill. And at that point there will have to be a determination made on whether or not we'll go ahead and proceed to drill in with the relief well and be prepared to go ahead and put the cement in. That will be a discussion that we'll have with the BP engineers when we know the results of the test. That may still leave up to 1,000 barrels of oil trapped in the annulus, but this could be recovered during the plugging operation later in time, and under another jurisdiction. But the well would be dead, and no further steps, including intersecting the bottom, might be needed. But they will likely do that any way, just to be sure.